Electrical utilities worldwide are faced with aging and overloaded transmission lines. But with the challenges of acquiring permits and approvals to construct new lines, many utilities concentrate on rating and up-rating existing ones. LiDAR data have become invaluable for this type of task. By L. J. Chaput, business manager, W.I.R.E. Services (www.wireservices.ca), Winnipeg, Manitoba, Canada. Point data used to model transmission line terrain and conductor sag and tension can be gathered with an aerial LiDAR survey. Many electrical transmission line owners are studying the feasibility of upgrading their existing infrastructure. They’re also busily assembling up-to-date inventories of lines for geographic information system (GIS) and maintenance programs. 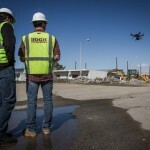 Both of these monumental tasks can be completed much more accurately and effectively with digital airborne light detection and ranging (LiDAR) data and orthorectified imagery. The data and imagery, combined with advanced modeling software, allows complete line verification and analysis. Determining the exact maximum thermal operating limits of a transmission line with respect to minimum ground clearances permits efficient, cost-effective upgrade solutions with minimal social and environmental impact. The key objectives of LiDAR analysis include precisely determining the thermal rating of transmission lines and identifying encroaching objects to the phase conductors—e.g., overgrown vegetation contained within the limits of the transmission line right of way. Finite Element Applications. 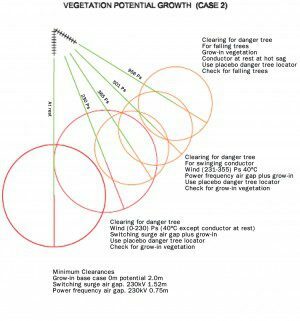 Conductor operating temperatures and weather events, as specified in national and local standards, are checked to the right of way for any detectable encroaching objects and vegetation in each span. A Finite Element (FE) feature for matching individual cables inside the model to actual LiDAR points allows for a comprehensive analysis of the entire line. Historically, cable sags are derived using ruling span calculations; unfortunately, this doesn’t provide an actual representation of the entire line span for span, phase for phase. 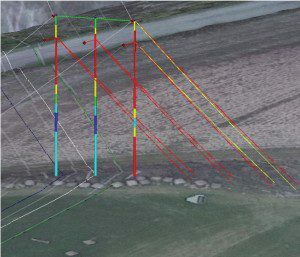 Separating and classifying individual LiDAR phase hits of each transmission line dead-end section allows software such as PLS-CADD, a line design package from Power Line Systems, to perform FE calculations that match the catenary shape of the conductor at the time of survey for each span. This analysis method produces a clearer understanding of the potential problem areas when clearance and thermal rating reports are generated. Instead of de-rating an entire line, utilities can focus on specific spans and/or phases to return a transmission line to its desired operating temperature. Figure 1. A growth simulation can be conducted for various tree species. Structural Analysis with As-Built Line-Specific Loading. Having the individual cables inside the model that closely match the LiDAR data using FE produces an as-built line loading table that delivers a more comprehensive structural analysis. Ruling span calculations don’t produce as-built, phase-specific loading, which is critical for accurate structural analysis. It’s especially important to use FE cable sagging in locations where the terrain is hilly or has short and long spans within the same dead-end section. Without the actual as-built conductor loading, incorrect sag and tension properties can be applied to individual structures, which translates into inaccurate structural analysis of the existing transmission line. Vegetation Survey and Management Programs. 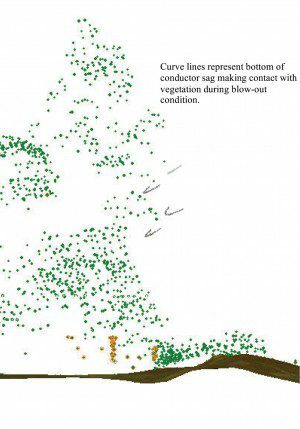 Clearance to vegetation analysis is performed easily using classified LiDAR data. Various options exist to perform this function; generally the number of data points dictates which method of analysis is chosen. A potential growth simulation also can be performed by increasing the required clearance from cable to vegetation point with a forecasted growth rate for various tree species. The simulated growth rate can be viewed in Figure 1. It’s also useful to use the falling tree option inside PLSCADD; this option checks to see if the arc distance created by a falling tree (data point) will encroach the required absolute clearances set out in the feature code table. Figure 2. A 3-D model made it easy to identify transmission line encroachments to silos. Other Important Inputs. Additional inputs for the model would include, but not be limited to, the clearance and loading criteria, the conductor base temperature calculation and the offset distances used during the analysis. Without a proper understanding of the affects of changing input, such as offset clearances and conductor base temperatures, there’s potential for confusing and erroneous output from the model, which can lead to costly and potentially dangerous situations. Having a dynamic 3-D model of your transmission line can prove to be a safety, time and cost-saving benefit. The model allows for multifaceted analysis options with which problems and solutions can be discovered and remedied quickly and efficiently. 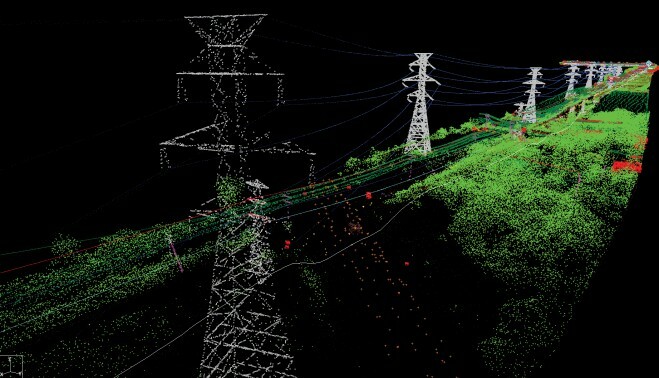 Examples of situations discovered using the LiDAR data in conjunction with transmission line software are best described with images. Consider grain silos located on a farm in western Canada with a 138 KV transmission line directly overhead. The profile view shown in Figure 2 displays the LiDAR points at the time of survey; note the red phase hits are approximately 1.5 meters above the top of the silo. The solid-colored lines represent the conductor at 100°C. 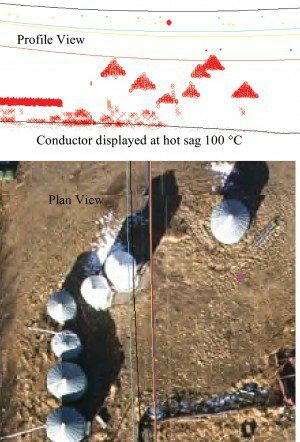 The red phase wire at 100°C, combined with a slight side wind, would make contact with the silo. This situation was remedied before any accidents occurred. Many other analysis examples can be discovered during routine analysis of a 3-D model based on accurate LiDAR data. Vegetation encroachments either in blow-out or grow-in conditions, as shown in Figure 3, are used to prepare management programs to ensure compliance with North American Electric Reliability (NERC) regulations for reliability and safety. Figure 3. A cross-sectional view reveals vegetation encroachments to a transmission line. As previously mentioned in the structural analysis section, the benefit of using as-built line loading derived from FE cable sagging provides a more comprehensive structural analysis tool. 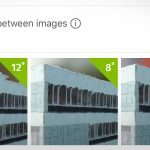 Overloaded structures, such as the tight running angle shown in Figure 4, can be identified easily. By improving the failing components, users can derive solutions to the dangerously overloaded structure. The components shown in red represent greater than 100 percent usage of allowable design strengths. Cost-effective solutions can generally be determined prior to catastrophic failures, which can lead to large outages and costly repairs. Utilities are quickly accepting the idea that it’s generally more cost and time effective to upgrade existing transmission line facilities than build new ones. 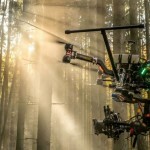 This idea lends itself well to LiDAR technology. Historically, utilities have designed transmission lines to predetermined capacities. The actual as-built capacity was never questioned until power demand rose and a larger capacity was required. At this time an upgrade scenario was developed and implemented over the entire transmission line, regardless of the actual existing rating. Granted, most transmission lines have some problem spans. Because of the conservative nature in which older lines were designed, however, there are many situations in which portions of a line exceed the original design capacity. To correctly address these situations, a complete thermal rating of the “as-built” existing line must be obtained prior to commencing an upgrade. Software makes it easy to determine which sections of the line meet the required capacity and which don’t. This allows the designer to develop upgrade scenarios based on actual conditions. Many large-capacity upgrades have been completed by modifying a small number of site-specific structures to gain ground clearance and allow for higher operating temperatures, which translates into greater capacity. Figure 4. A structural analysis displays overloaded components. Other upgrade scenarios include conductor change outs, which can be done easily inside the software. Having the as-built line configuration allows the designer to quickly check ground and aerial clearance requirements as well as complete a comprehensive structural analysis to ensure the new conductor doesn’t overload the existing structures. A re-engineering upgrade solution is becoming increasingly popular, whereby the original design criteria are analyzed to determine if certain criteria can be altered safely to allow for greater capacity. Examples of re-engineering include increasing the average wind velocity the line should experience on a daily basis. By increasing the assumed wind, a line will experience more convective cooling of the conductor, thus more loading can be applied to the line. Once the overall rating of the existing line is determined then small operating assumptions can be altered using sound engineering judgment. By changing small operating assumptions such as wind or ice loading criterion, utilities can gain considerable capacity increases with little capital expenditure. 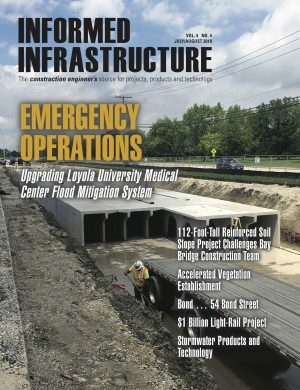 The integration of technologies such as LiDAR and 3-D computer analysis has proven to be an effective way to complete comprehensive asset evaluations. LiDAR surveys can be conducted in a fraction of the time of a conventional survey. The data gathered are considerably more comprehensive, allowing the user to create dynamic 3-D computer models of existing transmission lines to conduct thermal analysis studies. These studies form an integral part of a complete asset management program. Most importantly, with the knowledge of actual as-built conditions of each transmission line, utilities can efficiently forecast potential safety concerns and capacity problems. Author’s Note: I gratefully acknowledge the contributions of Eric Peyrot, PLS-CADD Power Line Systems; Tony Tubman and Art Silver, LiDAR Services International (LSI); and Jason Wowryk, Gerry Proteau, James Koop, Ralph Will and Anita Altinis, WIRE Services/Manitoba Hydro, in preparing this article. All images were obtained using orthorectified imagery supplied by WIRE Services and LSI and displayed in PLS-CADD.